Discussion in 'The Main Board' started by Atlas, Mar 17, 2019. @Bunker Bob just posted this interview with @Jerry D Young recently, if you haven't read it, please do. I think it turned out really well. This had me thinking, how many of Jerry's book I own. I believe it's in the 90's but I have to check. If you haven't ever read his work, it's not only entertaining but he talks about prepping for certain scenarios with each book and provides ideas on how to prep for them. jdp, Jerry D Young, Bunker Bob and 2 others like this. 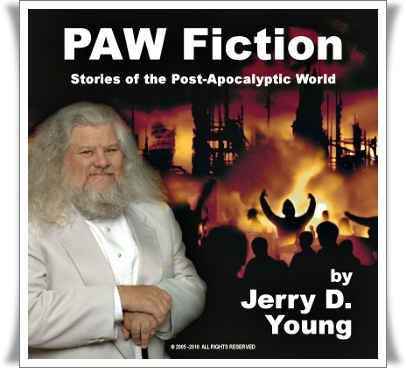 Not only are Jerry's books engaging--his own personal story is too! If folks haven't had the opportunity to read one of Jerry's books, I'd highly recommend doing so. Very few people have the knowledge, passion, and conviction that Jerry does. jdp, Jerry D Young, twp and 1 other person like this. If you ever have a chance to meet the man in person, you should. He is the real deal. I have the utmost respect for him. Let me second both compliments for Jerry. jdp, Jerry D Young and Atlas like this. I enjoyed the interview almost as much as I enjoy Jerry's books.